'Jurassic World 2' producer Colin Trevorrow has given fans a first look into the hotly-anticipated movie. The 40-year-old filmmaker posted the first picture from the 'Jurassic World' sequel - which stars Chris Pratt and Bryce Dallas Howard in the leading roles - to his Twitter account on Wednesday (08.03.17). 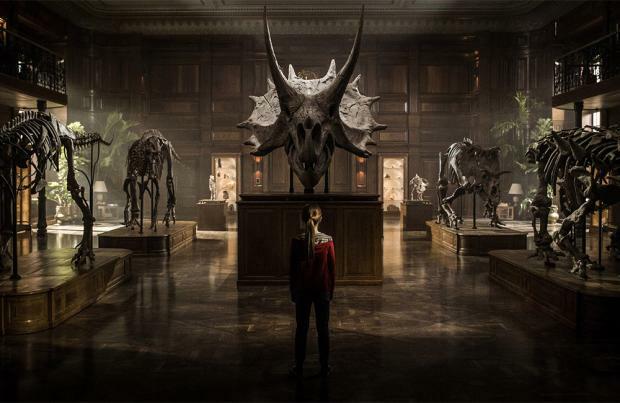 The pictures show a young girl - who has her back to the camera - stood amongst a museum exhibit of dinosaurs, staring straight at the giant skull of a triceratops. Captioning the image, he wrote: "Walking in giant footsteps. #JW2 (sic)"
Whilst director Juan Antonio Bayona wrote on his own social media account: "So excited to show you this!! A first look of the new Jurassic adventure. (sic)"
Meanwhile, Bayona previously teased the upcoming sequel - which is expected to be released in June 2018 - will be "darker" than the previous movie. Asked if the film will have a political subtext, he shared: "Yeah, you're right. I think there's a lot of that in the new 'Jurassic'. I think there's a lot of possessiveness towards our creations. I think it's very interesting where the new movie is heading. "It's so different from the other films, it talks a lot about the moment we live in right now. It's darker ... but at the same time, it's going to be a lot of fun. It's a blockbuster, you have Chris Pratt, it's a great adventure, but it's very interesting the way the film is darker than the other ones." And Bayona - whose film credits include 'The Orphanage' and 'A Monster Calls' - insists the 'Jurassic World' sequel will be "very different" from those movies. He added: "'Jurassic' is going to be very different from 'A Monster Calls' or 'The Orphanage,' but they called me because they loved 'The Orphanage' and 'The Impossible' and they wanted me to be leading the new 'Jurassic.' I think you're going to find some stuff that will remind you of my movies." The sequel to 'Jurassic World' is slated for release in June 2018.